Display the availability of any medical room, conference room, hospital office or employee with our 10" Framed slider sign. 2" tall rich black architectural metal frame with customizable nameplates. Choose between 4 metal plate colors with a sliding black tab. Personalize the left and/or right-hand side of your signs at no extra cost. If personalizing only ONE side the sign will display ALL BLACK when closed or not in use. 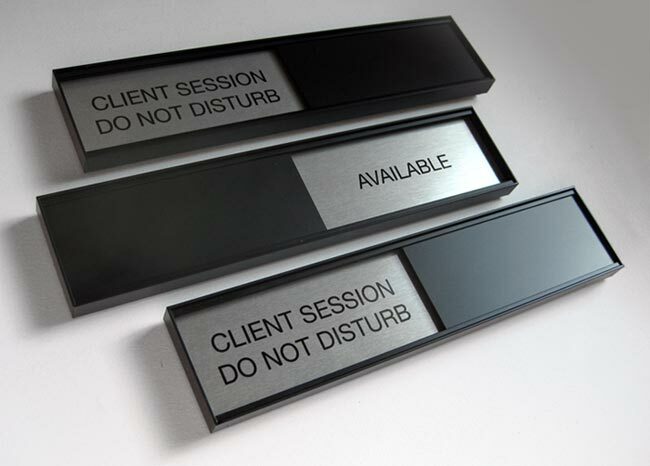 If you choose, you may customize BOTH the left and right sides of your sign (If you choose to personalize the left & right sides then one side of your message will display at all times and the black slider tab will cover exactly one half of the length of your sign messages.) Use the personalization fields below to customize the signage any way you like. Black frame with black top slider plate.